Good morning. Thank you for convening this hearing and for inviting me to testify. I have had the pleasure of working with a number of you and your staff in years past on immigration-related legislation. For the last several years, Colorado, and especially its legislature, has been a leader and a model for many other states in developing practical and effective programs to address the problem of illegal immigration, and I look forward to watching the discussions and proposals unfold in the new year. This morning, I will speak on the recent history of U.S. immigration trends and policies, and what they suggest for possible policy initiatives in Colorado. This afternoon, I will give you an update on the E-Verify system. My purpose this morning is to present some information on the evolution of immigration laws and policies in the United States, and the result of those policies in terms of the levels of immigration. I hope to provide some historical context and also some insight on the importance of state involvement in immigration policy. Many have tried to argue that immigration policy is strictly a federal issue, but the reality is that the state and local governments are the ones that bear most of the cost of the federal government’s policies, including choices it makes on the extent to which laws will be enforced. First, some numbers. The decade just concluded, 2000-2009, was the largest decade of immigration in our country’s history. According to an analysis of Census data recently completed by one of my colleagues, more than 13 million immigrants (legal and illegal) settled in the United States this past decade.1This is more immigration than any other 10-year period in American history, including the decade after the turn of the century, and even more than the 1990s, which was the second highest decade of immigration in U.S. history. What we are experiencing is not a surge in immigration, but really the continuation of a 70-year upward trend in annual immigration. As this first chart indicates, showing annual green card admissions since 1820, the United States has a very generous immigration policy, even with the numerical limits established in 1952. The chart does not show illegal immigration, which for much of the last two decades averaged about 500,000 net new settlers each year. This sustained period of high immigration is a departure from our historical experience. Contrary to what many believe, the previous large influxes of immigration have been relatively brief and followed by periods of relatively little immigration. One of the things we noticed when doing this analysis of recent immigration is that, unlike the 1990s, this past decade of record levels of immigration occurred at a time when there was very little job growth. At the same time that 13 million immigrants settled here, the economy actually experienced a net loss of about one million jobs.3 This influx of immigration occurred even through the last part of the decade, as the country was mired in a recession. This is in stark contrast with the situation in the 1990s, when we received nearly as many immigrants, but the economy also added more than 21 million jobs. These findings suggest a number of things. First, recent immigration may be straining our economy and our labor markets more than ever before, due to economic conditions here. But more importantly, we conclude that immigration clearly is not a phenomenon that will self-regulate as the economy goes through ups and downs. The level of immigration, including illegal immigration, is more a function of our policies than of the labor market or the economy. And if immigration, especially illegal immigration, is causing strain or having adverse effects, about which you will hear more about throughout the day, then state governments does not have to simply sit back and watch – there are policy options available to you that will help discourage illegal settlement and help avoid or minimize some of the problems associated with illegal immigration. Let’s step back now to take a look quickly at some of the important milestones in the history of U.S. immigration law, and how they have affected the flow of immigration. 1952 and 1965 – In 1952 Congress set up the basic structure of our legal immigration policy that exists today, with its emphasis on a) allowing immigrants to sponsor family members; b) allowing employers to sponsor skilled immigrant workers; and c) providing a safe haven for refugees and those seeking political asylum. There were some modifications in 1965 that adjusted the categories and annual levels of immigration, as well as quotas for each country. Today, about two-thirds of legal immigration is based on family relationships. Only about 15 percent of legal immigrants arrive as a result of their skills or sponsorship by an employer. Roughly the same number of people are admitted in the humanitarian categories. We also have a category for those who enter the annual visa lottery. Again, together these number about one million per year. This does not include hundreds of thousands who come on long-term visas, such as students and guestworkers. One key change in the 1965 Act was the establishment of numerical limits that applied to immigrants arriving from the Western Hemisphere, primarily Mexico. This occurred at the same time that a major guestworker program for Mexican farmworkers was ended in 1964. 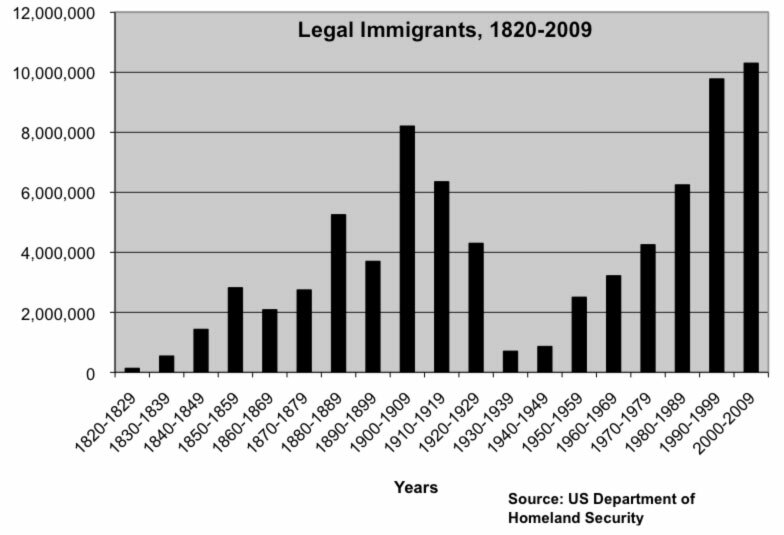 Throughout the 1970s, illegal immigration began to grow rapidly. In 1970, the Border Patrol apprehended about 300,000 illegal aliens trying to enter; by 1979, the number of Border Patrol apprehensions had more than tripled to about 1.1 million. 1986 – Public concern over illegal immigration grew throughout the 1970s and 1980s. Following the deliberations and recommendations of a bi-partisan commission, in 1986 Congress tried to settle the issue with what it called a “Grand Bargain” – it decided to provide an amnesty for about three million immigrants who had been present for several years or who had worked for a period in farm jobs. It also for the first time made it illegal for employers to hire an illegal immigrant. But the laws against illegal hiring proved to be ineffective, and within just a few years, the problem was back. For one thing, Congress failed to provide adequate resources to prevent illegal entry at the border. And, the new provisions against illegal hiring proved to be weak. The law was set up to fail – employers were required to demand documentation from workers, but were discouraged from challenging it even if it appeared to be fraudulent, or else face charges of discrimination. In order to sanction employers, federal immigration agents had to prove that employers had knowingly hired an unauthorized worker, and many unscrupulous employers could simply claim that the documents they were shown looked fine. A brisk market in false documents developed, enabling illegal immigrants to pretend to be legal, and enabling employers to get away with pretending to believe them. Also, many employers shifted the hiring to outside contractors to avoid liability if they were to come under the scrutiny of immigration officials. Making matters worse, Congress failed for many years to provide the immigration agency with the resources and staff necessary to create a climate of enforcement that would deter illegal hiring. Today, ICE, most employers, and illegal workers still operate under this same system. 1996 – Congress, responding to increasingly desperate cries for help from state and local governments and law enforcement agencies over the significant fiscal and public safety impacts of continuing high levels of illegal immigration, passed a major immigration bill in 1996. It was also partly inspired by the 1993 bombing of the World Trade Center by a group of Middle Eastern terrorists, some of whom were illegal aliens, and one of whom was legalized during the 1986 amnesty. Among other provisions, the 1996 law created three programs that have proven to be key to helping states address the illegal immigration problem: the Systematic Alien Verification for Entitlements (SAVE) Program, the verification system for employers now known as E-Verify, and the 287(g) Program. However, these programs would not be widely used until the mid-2000s, and I will say more about them in a minute. But, the creation of these programs is an acknowledgement by Congress that the problem is too big for the federal government to handle on its own, and also that there is a legitimate role – and specific tools – for states in deterring illegal settlement and in helping enforce immigration laws. In general, the 1990s were a period of decline in federal efforts to control immigration, except at a few places along the southwest border, where new fencing and increased patrols were proving effective. Not only was there a drop off in immigration enforcement at the workplace, there were a number of amnesties enacted by Congress and implemented through executive authority that resulted in hundreds of thousands of illegal immigrants gaining legal status. One such example was the award of Temporary Protected Status to illegal immigrants from Central America. In some states, including California and Arizona, citizens tried to force policymakers to address the problems by passing ballot initiatives and referenda, such as Proposition 187, which aimed to prevent the state of California from providing public benefits to illegal aliens. At the same time, immigrant settlement patterns were changing. 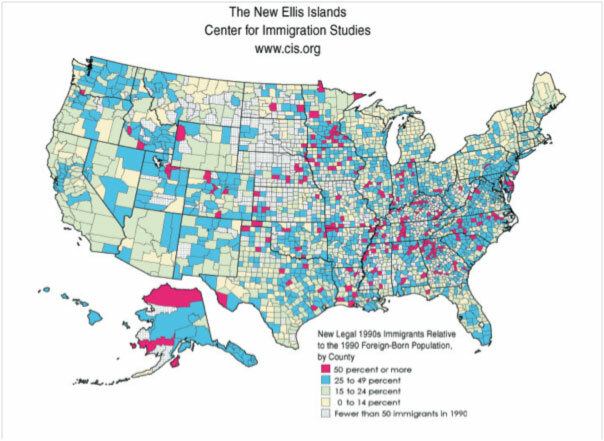 As illustrated in the map below, many areas of the country that had seen relatively little recent immigration began to experience new and rapid growth in the in the immigrant population. Immigration was no longer an issue for just five or six states. As you can see, some of these areas of rapid new immigrant settlement are in Colorado. The red and blue counties are those that experienced more than 25 percent growth in the immigrant population over the 1990s. 2001 – The terrorist attacks of 9/11 illustrated to policymakers and the public just how vulnerable we are when we fail to apply immigration laws and when we fail to control entry and settlement from abroad. After 9/11 many states moved swiftly to change their laws to improve homeland security – especially by changing their driver’s licensing laws, to prevent illegal immigrants from obtaining this key form of identification. The tightening up of licensing laws to require legal presence has proved to be one of the most important improvements in immigration law enforcement as well, because illegal aliens can no longer conceal their lack of status from authorities, employers, or from those providing financial services, for example. This begins the trend, which continues today, of state and local governments adopting laws, regulations and ordinances to prevent illegal aliens from accessing various kinds of public benefits. At the same time, the federal government begins to step up some of its efforts to control the border, even as interior immigration enforcement is still a low priority, especially workplace enforcement. Illegal immigration continues to grow in the first half of the decade. We estimate that the size of the illegal population peaked in 2006, at about 12-13 million. About half of all the arrivals from abroad during the decade were illegal, and by the end of the decade, about one-third of all immigrants were illegal immigrants. About 30-40 percent of the illegal population is estimated to have entered on a legal visa and overstayed; this realization underscores the need for enforcement at the workplace in addition to the border. Something changed between 2006 and 2010. Many states began to use the tools that were created back in 1996; they started adopting policies and laws to discourage illegal immigration, such as requirements for employers to use E-Verify and for state agencies to use SAVE. Local law enforcement agencies began flocking to the 287(g) program, which enables them to arrest and process illegal aliens involved in crime. Congress provided significant increases in funding to immigration enforcement programs. The Border Patrol increased staffing, technology, prosecutions, and especially new fencing. Immigration and Customs Enforcement (ICE) boosted its programs to remove criminal aliens, gang members, and fugitives, and also revived its worksite enforcement program, including large and small operations to raid and prosecute egregious employers and workers, especially those using fraudulent documents. Meanwhile, job opportunities in key sectors for illegal workers, such as construction and services begin to dry up as the economy dipped into recession. By 2009, we detected a new trend – for the first time in many years, the size of the illegal alien population was shrinking. Our analysis of the census data showed that from 2007 to 2009, the illegal population decreased by about nearly 14 percent, or by 1.7 million people.4 We determined that not only were fewer people arriving to settle illegally, but more illegal residents were leaving of their own accord, in excess of the number that the federal government was removing. Given that the level of legal immigration has been relatively constant, it is likely that the drop in the total immigrant population in Colorado that I mentioned earlier is due at least in some significant part to a drop in the illegal alien population. Other states that have adopted strong policies on immigration have also experienced or reported declines in the illegal alien population, including: Virginia, Arizona, Rhode Island, Oklahoma, South Carolina, and Tennessee. These results suggest strongly that it is possible to reverse the upward trend in illegal immigration and shrink the size of the illegal population, through deliberate policy changes, ideally in tandem with federal efforts. Second, unlike a decade ago, when it was possible for almost anyone to travel here illegally and start a new life, illegal immigration today is very much a form of organized crime. In general, individuals do not come here on their own; they are smuggled in, either walking, hidden in a vehicle, on a boat, or through a legal port of entry with false documents. They pay a fee. They are held in safe houses or drop houses on both sides of the border. The entries must be organized, because the Mexican drug cartels now control most of the territory in the border areas. When they make it to the United States, they are often imprisoned in a drop house and threatened with physical harm so that the smuggling ring can extort higher payments from their friends or relatives. Some are killed, raped or beaten; some are just starved and humiliated; some are forced into participating in drug trafficking or prostitution. They often are transported to their final destinations by van or bus, sometimes using the interstate highways that cross Colorado. When they arrive at their destination, the same organization often arranges for a set of false documents and a job. This is not a benign phenomenon that merely enables hardworking people from poor countries to have a better life – it is a criminal enterprise that often goes hand in hand with other criminal activity. Violence is an accepted business practice, and the illegal immigrants are usually exploited and sometimes harmed in the process. It is very lucrative and has progressed to the point that it requires a coordinated approach from state, local and federal law enforcement and other government agencies. Thirdly, there are still many places, such as Denver, that maintain sanctuary policies where by policy government officials must refrain from asking about immigration status, ignore violations if they are apparent, or even provide documents such as municipal “identification” cards to the undocumented. These policies have the effect of shielding illegal aliens from immigration law enforcement and seem to attract illegal settlement. Finally, there has been a distinct shift in focus at the federal level with respect to immigration law enforcement priorities. The Obama administration (with the support of the leadership in the 111th Congress) has adopted a near-exclusive focus on criminal aliens. They have established policies to try to ensure that only those illegal aliens who are convicted of serious crimes will be arrested and removed. In addition, this administration has all but abandoned vigorous enforcement of the law at the workplace. Their approach has been to audit the hiring records of selected employers, and urge compliance with hiring laws, while relying mostly on warnings to most employers with suspect documents and imposing fines on a handful of employers. Colorado can take a number of steps to build on previous initiatives that support and supplement federal immigration enforcement, boost removals of illegal aliens, and help create a “rule of law” environment that is not appealing to illegal settlers. Expand verification of immigration status at the workplace – I’ll speak more about this in the afternoon session. It can mean passing a law to mandate that all employers, or more employers, use E-Verify and the Social Security Number Verification System (SSNVS). It can include compliance and enforcement measures such as company or agency audits. It should also include an examination of the state’s identity theft laws so that those who commit identity fraud for the purpose of illegal employment can be prosecuted and so that restitution can be made to the victims. Implement ICE’s Secure Communities program – Under this program, which is now operating in 34 states, ICE has identified and put on the path to removal about 100,000 criminal aliens who were flagged as they were booked into a local jail. But state officials have blocked its deployed in Colorado. The legislature should press the executive branch to more forward without further delay. Establish state-wide protocols for law enforcement encounters with foreign nationals – Since not all criminal aliens are in jail, the state should promote the establishment of common law enforcement practices, including clarifying that local officers may ask about the immigration status of those in custody or under investigation, when they should ask, and when and how to notify ICE. Sanctuary jurisdictions should not be tolerated in the state. Continue support for 287(g) – The 287(g) program created by the legislature for the Colorado State Patrol has been very effective in addressing alien smuggling and other public safety issues associated with illegal immigration. It has been a model for other states, including Georgia, Missouri and Rhode Island. Together with the El Paso County’s program, these local initiatives account for about one-third of all the immigration arrests made in Colorado – a major force multiplier for ICE. Lawmakers should consider forming another dedicated immigration crime unit that could focus on gangs, illegal employment, identity fraud, tax evasion, and related issues. Monitor state agencies – The legislature should not hesitate to use its oversight authority to make sure that state agencies are complying with laws and regulations to prevent illegal immigrants from accessing public benefits, especially by using SAVE, E-Verify, and SSNVS. Good afternoon. In this session I will give you a brief update on the status of the E-Verify program nationally and in Colorado, share some insights from one long-time E-Verify employer, and provide information on another state’s successful experience with a universal mandatory verification policy. I also have some information on the very mixed results of ICE’s workplace enforcement program, which underscores the need for strong state policies. As you know, E-Verify is a free system set up by the federal immigration agency in 1996 to allow employers to verify the immigration status of newly-hired workers. While E-Verify is not a magic or perfect solution to the illegal immigration problem, it is a very effective program, and its use must be greatly expanded to curb illegal employment and restore job opportunities for legal workers. To reinforce some of the other testimony you have heard today, several surveys have shown that the vast majority of employers (95%) who participate in E-Verify say that it is not a burden to use and that it helps them avoid hiring illegal workers. As of November 20, there were 235,000 employers using E-Verify nationwide. U.S. Citizenship and Immigration Services (USCIS), the agency that runs E-Verify, says that there are enrolling roughly 1,000 new employers every week. They process about one million queries every month. Eleven percent of the employers using E-Verify report that they are doing so because of a state or local government mandate. In Colorado, there are currently 6,606 employers using E-Verify at 23,000 sites. So far this fiscal year, 40,000 queries have been processed. According to USCIS, at this time the system identifies roughly 2.9 percent of the queries to be unauthorized workers. That means that in Colorado, E-Verify probably prevented more than one thousand illegal hires over a seven week period. That is a significant number and, as I’ll explain in greater detail later, is probably more effective than ICE’s enforcement operations in the state. 97 percent of workers queried are cleared immediately; only three percent are not. A small number, less than four percent, of the queries are estimated to be illegal workers who are erroneously approved. These are usually imposters using genuine documents and/or identity information. USCIS has taken some steps to prevent this, including sharing photographs and monitoring queries for multiple uses of Social Security numbers or other documents. While opponents of immigration law enforcement have focused on the imperfections of E-Verify, particularly the vulnerability to identity theft, the employers who use E-Verify reply that it is still far superior to the existing I-9 system. The biggest problem with E-Verify now is that it is voluntary, and employers can simply excuse themselves from complying with immigration laws. This can put some employers who are doing the right thing at a disadvantage if they have to compete with employers who rely on cheaper illegal labor as their business model. Indiana Packers. As we have heard today, there are many employers out there who want to do the right thing and who do their due diligence in hiring. I have learned that some are willing to do this, not out of fear of being the subject of an immigration raid, but because it is good for their business and helps them stay profitable. The Indiana Packers Corporation has no such trouble finding workers. They are proof positive that a company in that industry can maintain a completely legal workforce and not only be competitive, but be a leader in the industry. Indiana Packers was among the first two dozen companies to sign up for E-Verify when it was launched back in 1996 (then known as Basic Pilot). In addition, they use the Social Security Number Verification System (SSNVS) to confirm payroll records with the Social Security Administration, which helps ensure that existing workers on the payroll also are legal.8 They believe that taking steps to maintain a legal work force sends an important message to the workers, communicating that the company respects the law; and by extension it respects the workers too, and goes hand in hand with providing decent wages and working conditions. According to Mr. Jacobson, “Legal workers are more reliable, because they come to work on a daily basis without fear.” And, he says, an all-legal workforce is more stable, meaning the company has less turn-over and spends less on training and recruiting. Unlike its competitors, Indiana Packers does not have to recruit beyond a 30-mile radius of the plant; it is firmly entrenched and tied to the community where it is located, which is good for the company and good for the community. E-Verify Rules Produce More Workplace Compliance than ICE Audits. About two years ago, ICE implemented a new strategy for immigration law enforcement at the workplace; it ended the practice of raiding work sites and arresting illegal workers, followed by criminal charges against employers, in favor of auditing company personnel records, followed by warning letters and sometimes fines. If ICE auditors find that an employer has hired workers it suspects are illegal, for example, ICE can order the company to enroll in E-Verify as part of a settlement. The ICE audits are proceeding at a very slow pace. In 2009 and 2010 ICE selected about 3,000 companies to be audited nationwide, including about 60 in Colorado. They have completed about 39 audits in Colorado. In those cases, ICE auditors reviewed about 5,600 I-9 forms and found about 600 “suspect” employees, representing about 10 percent of the workforce it reviewed. About half of the companies audited had no suspect employees. Of the 20 companies with suspect employees, about 10 were fined and 10 received warnings. ICE levied about $200,000 in fines on employers. Those audits are useful, and undoubtedly provide some level of deterrence to illegal hiring, at least at those companies that are audited. They surely would provide more deterrence if the results of the audits were made public. The audits also help educate employers on an individual basis on how to avoid hiring illegal workers and how to detect them in the workplace, even if identity fraud is occurring. Some illegal workers have lost their jobs, presumably creating new opportunities for legal workers. But Colorado’s law requiring certain employers to use E-Verify seems to have had much more of an effect in preventing illegal hiring than ICE audits. As I mentioned earlier, E-Verify could be preventing as many as 1,000 illegal hires every couple of months in Colorado, versus the 600 illegal workers found by the ICE audits over a period of nearly two years. If E-Verify were to become mandatory in Colorado, ideally phased in over time, then most employers eventually would be in basic compliance with immigration laws, and employment opportunities for illegal aliens would be significantly more constricted. Such a law would have far, far more impact on employer behavior than ICE’s activities could ever influence. In addition, ICE could focus its attention on the most egregious employers and on addressing the identity fraud that can undermine E-Verify’s accuracy. State Audits of Employers Supplement ICE Efforts and Boost Compliance. ICE is not the only entity that has the authority to audit employers for compliance with immigration laws. Some states have found auditing to be a useful tool to expose vulnerabilities in the hiring process and to discover and penalize egregious employers, sometimes with fines. In late 2006, the North Carolina state auditor’s office conducted a review of SSN and wage records at several public employers. The review including a screening of wage records with SSNVS, which is now required for public agencies under state law. The audits and SSN reviews uncovered a pattern of problems with use of false SSNs at public institutions. For example, at North Carolina Central University, the audit found 28 student and non-student workers with invalid SSNs, 14 workers with numbers on file that belonged to deceased persons, and another 18 that were discovered to be invalid as a result of tips from employees. About half the discrepancies turned out to be the result of data entry errors by university payroll staff, so the workers benefited from this discovery and could correct their records to receive proper credit for earnings. Most of the rest of the employees identified in the review admitted that they obtained the invalid SSNs from other people, and a few simply resigned or disappeared rather than be interviewed about the discrepancy. The North Carolina SSNVS audits at other institutions uncovered not only unauthorized workers on the agency payrolls, but also individuals who were trying to mask their identity to avoid criminal offender screening and child support obligations. In 2010, more than 950 smaller businesses were audited, and reportedly 88 percent are complying with the law. The state budgeted $750,000 for the auditing program in 2009 and $2 million in 2010. There are 13 investigators who conduct the audits. In addition, the state sends out a press release each time an employer is caught with a significant number of illegal workers, which the state considers to be an equally effective deterrent. In sum, there are a number of different options the legislature can consider to prevent illegal hiring: by expanding mandatory use of E-Verify to more or all sectors of the state economy; by implementing an auditing program to monitor employer compliance; or by promoting use of the federal government’s effective tools like E-Verify and SSNVS through outreach and incentives. 1 Steven A. Camarota, "Immigration and Economic Stagnation: An Examination of Trends, 2000-2010," Center for Immigration Studies Backgrounder, November, 2010, http://cis.org/highest-decade. 2 Kathleene Parker, "Population, Immigration, and the Drying of the American Southwest," Center for Immigration Studies Backgrounder, November, 2010, http://cis.org/southwest-water-population-growth. 4 Steven A. Camarota and Karen Jensenius, "A Shifting Tide: Trends in the Illegal Immigrant Population," Center for Immigration Studies Backgrounder, July, 2009, http://www.cis.org/IllegalImmigration-ShiftingTide. 6 Ronald W. Mortensen, "Illegal But Not Undocumented: Identity Theft, Document Fraud, and Illegal Employment," Center for Immigration Studies Backgrounder, June, 2009, http://www.cis.org/IdentityTheft. 7 See Jerry Kammer, "The 2006 Swift Raids: Assessing the Impact of Immigration Enforcement at Six Facilities," Center for Immigration Studies Backgrounder, March, 2009; http://www.cis.org/2006SwiftRaids. 8 For more on SSNVS, see the Social Security administration’s website at http://www.ssa.gov/employer/ssnv.htm.